What Is DD Form 1351-6? DD Form 1351-6, Multiple Payments List is a form used to document the payments made by a group of Department of Defense (DoD) employees traveling or performing temporary duties under similar conditions. A claim voucher (DD Form 1351-2) attached to the submitted DD 1351-6 will cover the entire group. The latest version of the form - sometimes incorrectly referred to as the DA Form 1351-6 - was released by the DoD in June 1993 and replaced the DD Form 115, DD Form 1351-1 and the November 1964 edition of the DD 1351-6. An up-to-date DA Form 3685 fillable version is available for digital filing and download below or can be found through the Army Publishing Directorate website. DD Form 1351-6 is may serve as a payroll list and is used to verify the information provided in an individual's tax return. The form cannot be used for paying civilian PCS advances. be used as a payroll list. regulation, or order in this claim for restitution. Voluntary; however, failure to furnish requested information may result in total or partial denial of amount claimed. (NOV 64), which may be used until DEC 31, 1993. Each page should be numbered. The total number of copies of the DD 1351-6 submitted with one claim should be entered in the top line of the form. The type of payment should be identified in Item 1. If applicable, the payroll number should be entered in Item 2. Item 3 requires the date of payment from the attached claim voucher (DD Form 1351-2). Item 4 is for the name of the organization or station preparing the form. Each payee should be listed in the chart in Item 5. The required information includes the employee's full name, their Social Security Number (SSN), travel order number, employee's signature and the payment amount. The last entry should be followed by the words "End of listing". The form requires specifying the total amount of payments shown on all preceding lines for every individual page. If several forms are used, the last page must specify the total number of forms used in together. 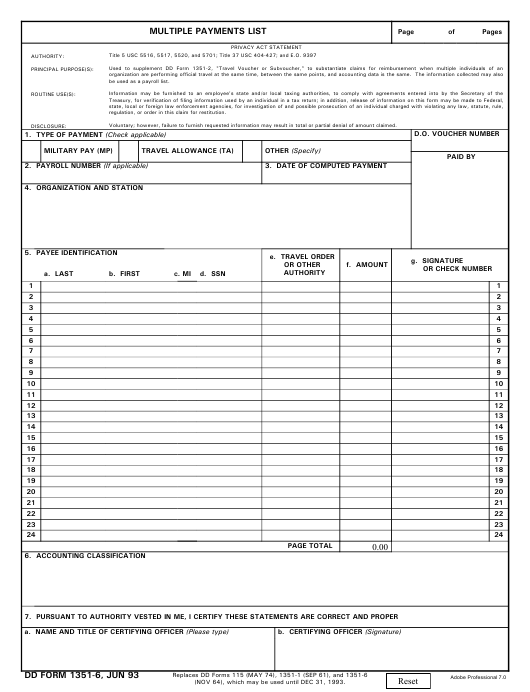 The AF Form 938 (Request and Authorization for Active Duty Training/Active Duty Tour).